Apple has suffered from sluggish iPhone sales and a slowing Chinese economy, but it produces innovative, aesthetically pleasing products that are likely to remain in demand. Apple's (AAPL - Get Report) CEO Tim Cook might have assumed a TV interview would help arrest the fall in his company's stock prices after it reported declining revenues for the first time in 13 years. Cook tried to calm investors in his interview Monday night with Jim Cramer on CNBC's "Mad Money" show. The stock hasn't moved much post interview. Investors were clearly spooked by mega-investor Carl Icahn's decision to dump his 53 million Apple shares. Icahn's move stemmed from deep-rooted concerns about Apple's sluggish Chinese business. But a mass selloff in Apple is unjustified. The company continues to product aesthetically pleasing products that are in demand. The arrival of its newest iPhones this year and next should spark consumers' interest. Both versions, particularly a 2017 iPhone 8 will feature innovative, new technology. The company remains at the forefront of many tech trends. In addition, its services division has performed ably and seems likely to increase its market share. Apple remains on track for big gains over the long haul.This tech stalwart belongs in your long-term wealth-building plan. To be sure, Apple has faced new challenges in recent months. It has suffered from declining smartphone sales worldwide and a slowing Chinese economy. Apple's uninterrupted revenue increases since 2003 hit a bump in the second quarter as sales slipped 16% on the year and 32% on a sequential basis. Naysayers say that the company's magical period is over. Cook blamed a strong U.S. dollar, a slower pace of people upgrading to new iPhones and dull demand from the once robust Chinese market. Apple was also forced to shut its iBooks store and iTunes movie service in China, shortly after starting them. Apple's flagship iPhone product contributes to over 60% of its total global revenue. A sales dip of this product would understandably rattle Wall Street. At $12.5 billion, iPhone revenues from China in the most recent quarter fell over 25%, following a 14% drop the previous quarter. In the same period a year ago, sales from the region rose 71%. That may be part of a larger trend, though. According to industry observers, smartphone sales have passed their period of explosive growth. According to tech researcher Gartner, smartphones sales in China, which is the world's largest smartphone market, will increase a meagre 0.7% in 2016 as the market reaches saturation point and users delay device upgrades. It's unreasonable to expect Apple or any other phone maker to grow at the same pace of previous years. Still, Cook believes that there is potential in India and in China's burgeoning middle class. Cook also identified India as an untapped market, with the country set to become the world's most populous country by 2022. Gartner said India represented an exception to slowing smartphone sales. Gartner said that smartphone sales growth in India was set to reach 29% in 2016, with double-digit increases expected to continue through 2018. That's a stark contrast to the single-digit sales growth expected for the rest of the market. Apple still has plenty of steam left and should be a part of your retirement strategy. This isn't the first time that Apple has faced challenges that seemed to suggest a long-term decline. In January the stock stood around its present level in the mid $90 range before rebounding to over $110. If anything, Apple has more reason to rebound from its most recent declines. First of all, analysts and investors are now betting big on the iPhone 7 launch expected this fall. Secondly, Apple's high-margin Services business -- comprising AppStore, Apple Music, Apple Pay and iCloud -- climbed 20% to $5.99 billion. It is now Apple's second-largest business segment following the iPhone and has likely only begun tasting success. Thirdly, with the iPhone 8 due in late 2017 rumored to house new camera designs and mobile virtual reality headset support, pessimists should know that innovation at Apple is far from over. Finally, with $230 billion in net cash and liquid reserves, Apple has enough financial muscle for investment in research and development, acquisitions, or both. It bears noting that Carl Icahn expressed no concerns about Apple products, innovation or management. His exit coupled with the disappointing quarter may even have created an opportunity for investors. The stock is trading at nearly 52-week lows. That's a good price for entering the stock. 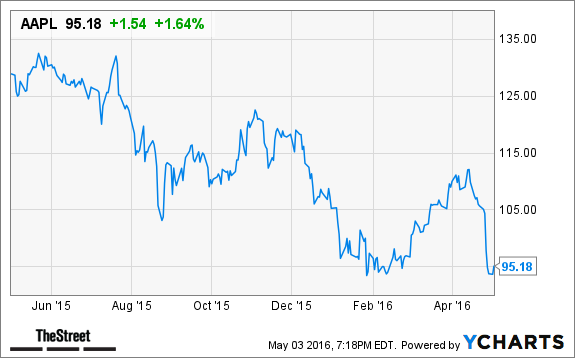 Some analysts are expecting Apple to touch $185 over a 12-month period. Moreover, Apple is available at a forward price-to-earnings (P/E) of very modest 10.23 times. Compared to the forward P/E multiple of 17.59 times for Alphabet, 17.45 times for Microsoft and a lofty 70.43 times and 90.62 times for Amazon and Netflix, respectively, Apple stock is a good buy. The Apple story is far from over with every dip being a golden opportunity to enter.